That’s one very famous balcony. The balcony on the second floor facing the back gardens doesn’t look particularly special. But here in the Czech capital city of Prague there’s an important connection between that building’s balcony and events leading to the fall of the Wall. This building is also the German Embassy, and it’s where Hans-Dietrich Genscher looked over the crowds from the balcony and made a famous speech in 1989. All over eastern Europe, the iron fist of decades-old communism was beginning to collapse. In May, Hungary had begun removing parts of the their wall, but under the pretense of a “Pan-European Picnic” near the town of Sopron in August, the country opened its border with Austria for three hours, allowing hundreds of East Germans (people from the GDR1) free passage into western Europe. Hungary would eventually open their borders for good in mid-September. The Czechoslovak Socialist Republic (Czechoslovakia) was the “bridge” connecting East Germany with West Germany’s Bavaria, and Czechoslovakia’s capital city of Prague was also home to the West German Embassy. Eventually, thousands of East Germans seeking passage to the West crossed the East German-Czechoslovak border and arrived in Prague. Refugees streamed into the gardens of the West German Embassy. An estimated 4000 East Germans occupied the cramped gardens, and living conditions deteriorated quickly. For all, the goal was one and the same: they all wanted to go west and they needed permission to leave the embassy and enter West Germany. Negotiations took place among the two German states and the United Nations. On 30 September 1989, Hans-Dietrich Genscher, Foreign Minister and Vice Chancellor of West Germany, arrived at their Embassy in Prague to deal with the growing crisis and to address the crowds of East German refugees. Murmurs from those camped on the grounds grew louder in excited anticipation. In the evening, Genscher stepped onto the upper balcony. People looked up to the balcony with high expectations. Among calls for silence, Genscher spoke into the microphone. Wir sind zu Ihnen gekommen, um Ihnen mitzuteilen, dass heute Ihre Ausreise in die Bundesrepublik Deutschland möglich geworden ist. Genscher never made it past the word, “Ausreise” (departure). This was the only word people needed to hear. Genscher’s remaining words were immediately drowned out to deafening shouts of joy, disbelief, relief, and applause. In the following days, special trains arrived in Prague to bring East German refugees directly into West Germany. East German leader Erich Honecker said: “Wir weinen niemandem eine Träne nach, der das Land verlassen will” (We won’t shed a tear for anyone who leaves the country.) which was also quoted in the 2 October 1989 edition of the East German state-run newspaper “Neues Deutschland”. Within six weeks, the Berlin Wall fell on 9 November. 1 GDR was the English acronym for East Germany, formally known as the German Democratic Republic. I’m standing at the bottom of Petřín hill against a tall metal security fence on the muddy track separating the city’s public green space from the land belonging to the German Embassy. I’m lurking at the back of the embassy, pointing my camera through the fence. It’s hard to believe I’m the only one here, at least for the time being. I’m surprised I haven’t already been flanked by guards, wondering what the hell I’m doing here. If I tried to make a run for it, I’d be trapped between a hill and a hard fence. The expected guards don’t come, and the only people who appear are other curious visitors. 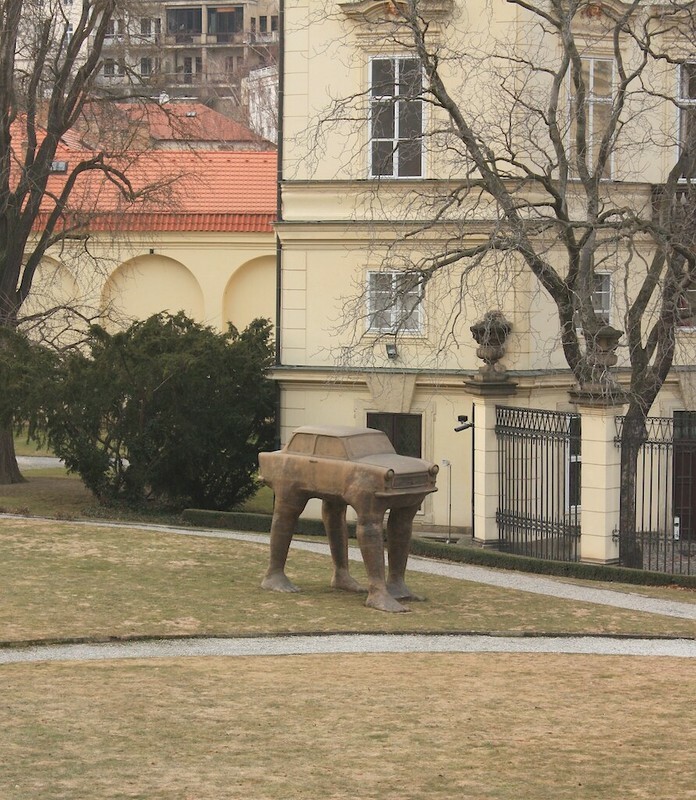 Czech artist David Černý created the sculpture “Quo Vadis?” (Where are you going?) to pay tribute to the thousands of East Germans who sought refuge in Prague. The sculpture is a Trabant car on four legs which was once a ubiquitous symbol of industrial productivity in East Germany. Hundreds of Trabants were left behind in Prague as East Germans made their way to the West. 2019 will mark the 30th anniversary of Genscher’s famous speech in Prague, and the 30th anniversary of the fall of the Wall. The Lobkowicz Palace – a place of German, Czech, & European history. On 30 September 1989, West Germany’s Foreign Minister Hans-Dietrich Genscher stood on the balcony of the Lobkowicz Palace, and with these words, announced to almost 4000 refugees permission to travel into West Germany. Three months later communism was no more in Czechoslovakia, and former dissident Václav Havel would be elected as the new president. 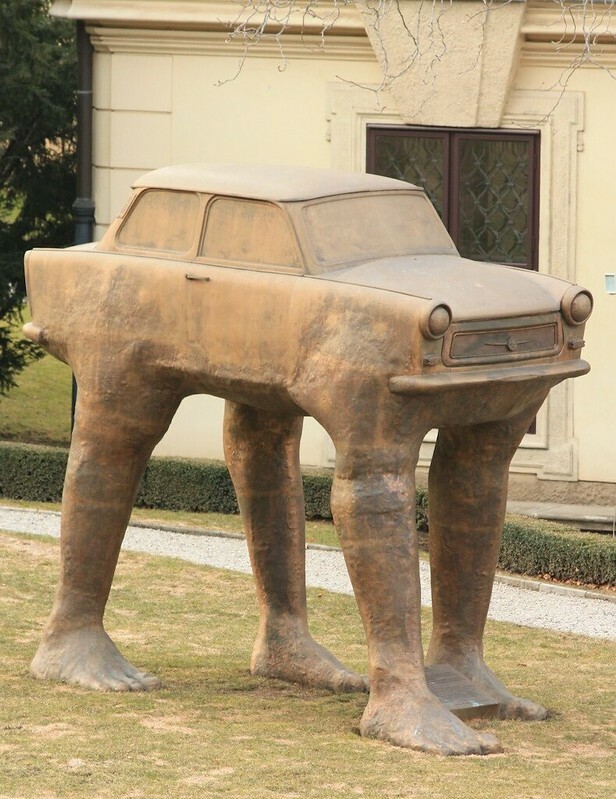 The Trabant sculpture “Quo Vadis” by David Černý is a reminder of the events in the autumn of 1989. The original sculpture is in the collection of the Zeitgeschichtliches Forum (of Contemporary History) in Leipzig, Germany. Built Baroque style in 1702, the palace was owned by the Bohemian aristocratic Lobkowicz family since 1753. Ludwig van Beethoven and Carl Maria von Weber once performed concerts under the palace’s domed hall. The palace was sold by the Lobkowicz family to the Czechoslovakian state in 1927, and has been the site of the German Embassy since 1974. Czech: Velvyslanectví Spolkové Republiky Německo. German: Botschaft der Bundesrepublik Deutschland. English: Embassy of the Federal Republic of Germany. From tram stop “Malostranské náměstí” in Prague’s Malá Strana, walk south towards and along Karmelitská. Turn right (west) onto Tržiště. With the U.S. Embassy (Velvyslanectví USA) on your left, stay left at the fork in the road. You’re now on Vlašská street; walk uphill. When a hospital (Nemocnice Milosrdných Sester sv. Karla Boromejského v Praze) appears on the right and an open portal to a children’s park is on the left, enter the park. At the end of the path, turn left to follow the outside portion of the high metal fence of the German Embassy. The foot of Petřín hill will be on the right. Continuing next to the fence, you’ll see Černý’s Trabant sculpture “parked” inside the garden with signage (in Czech and German) next to the fence. • A personal account from Christian Seebode (in English). I’m grateful to his son, Georg, for the link and reference. • 4-minute summary of events at the West German Embassy in Prague, video in German. • Tagesschau nightly West German news broadcast, on 30 Sept. 1989, video in German. • The aftermath, train(s) to freedom (Zug in die Freiheit): on MDR, in German. • Genscher returns to the German Embassy in Prague in 2014 for 25th anniversary, on ARD’s Tagesschau, video in German. I made the five photos above on 17 March 2010. This post appears on Fotoeins Fotografie at fotoeins.com as http://wp.me/p1BIdT-3CN.